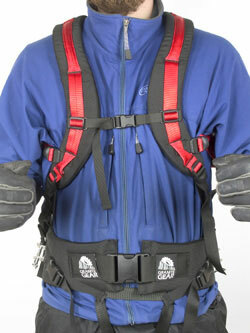 Our smooth pulling, covered sled and innovative harness system team up to provide a great way of getting your gear up the mountain or deep into the backcountry. The sled has a huge carrying capacity—15, 000 cubes. With a crossed fiberglass stay system, flexible nylon connecting rods and a “zero play” full body harness, our sled pulls and turns like a dream. • Thermo-molded, high molecular weight hull is lightweight and offers the lowest “coefficient of friction” (drag) on snow of any molded plastic. 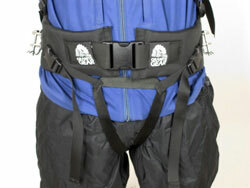 • Tough, Rex-Twill ® cover has three compression straps to secure gear and a full length zipper for access. • The hull's molded-in ski runners exactly match those of cross-country grooming equipment. 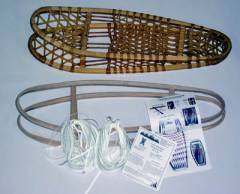 The sled tracks well on ski trails and can be used to set tracks. 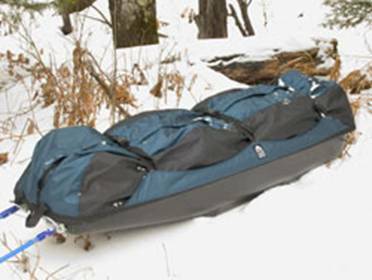 • Lightweight— Sled, cover and harness system = 16.75 lbs. • Strong, fiberglass poles (53”) break down into sections for easy transport. 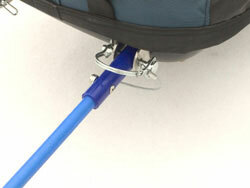 Pole ends are made of a strong, flexible nylon. This allows normal hip rotation during turns on skis, helps the sled follow you, and reduces the chance of pole breakage. • Quick connect/disconnect hardware makes “hooking up” and unhooking fast and simple. 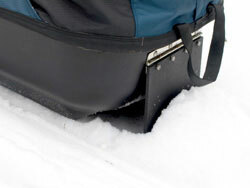 • Brake prevents sled from sliding backward on slopes. All snowshoe kits are made with straight grain white ash. 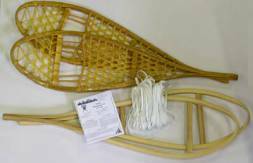 People tend to make snowshoes from kits not so much to save money (which you do, but it's a fringe benefit) as to have the satisfaction of making something fine. Small Age 8 to 140 lbs. 10" X 48" 510" sq. Medium 130 to 240 lbs. 11" X 54" 645" sq. Large 6' tall & 210 lbs. and up 12" X 60" 700" sq. Alaskans Large up to 260 lbs. 10" X 56" 700" sq. Xtra-Large up to 300 lbs. 12" X 60" 872" sq. Green Mountain Bearpaw Medium up to 200 lbs. 10" X 36" 554" sq. Huron's Children's Age 4 to 80 lbs. 9" X 29" 300" sq. Adults up to 220 lbs. 12" X 42" 550" sq. Strong, always flexible (even when wet or cold), won't stretch, decay or be eaten by rodents. The unique, common sense mounting angle (works for any traditional snowshoe) gives extraordinary lateral control so your boot always aims the snowshoe. 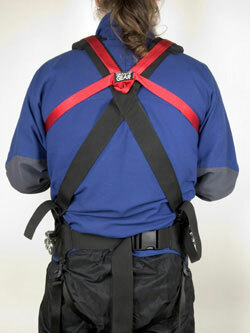 This would be the binding we would recommend for your own personnel snowshoes. The one disadvantage of this style is that it does not quickly adjust to other boot sizes. 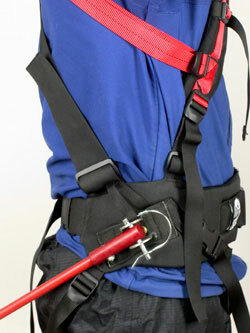 If you want a binding that will adjust easily and quickly to many different boots try the Super ''A''. You will, however, give up some control. Sold in pairs. Modified H fits up to men's boot size 13.